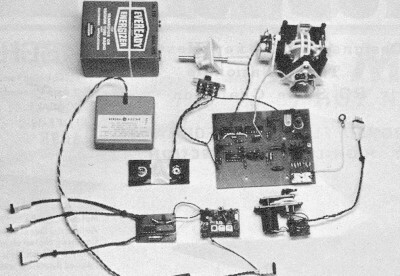 Believe it or not, there was a day when building your own electronics was a good way to save money if your budget was smaller than your appetite for R/C systems, radios, even TV sets. Heathkit comes to mind for all us old-timers as a source of pre-kitted products, but like most electronics companies of yore, they no longer offer kits; it is much cheaper to have complete systems built overseas. Besides, modern components - resistors, capacitors, ICs, etc., are far too small for most people to work with successfully. 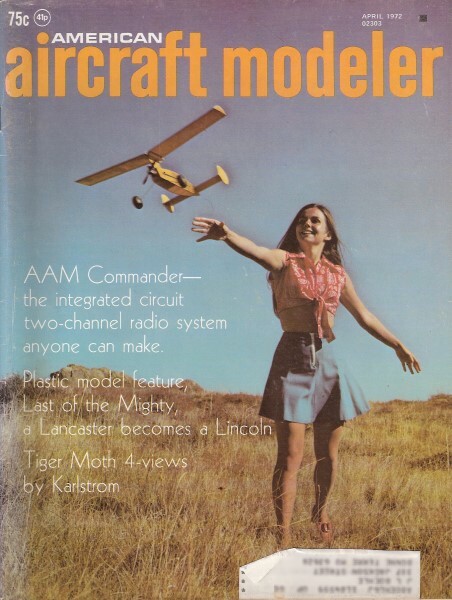 Here is a two-part article from the April and May 1972 editions of American Aircraft Modeler showing how it was done with a custom 2-channel digital proportional radio control system dubbed the AAM Commander. It still makes a good read because of the theory of operation that is covered. You can make the two-channel digital system which offers reliability, performance, goof-resistant assembly, and low cost by extensive use of integrated circuits. It seemed to us two years ago that our readers would be interested in the presentation of a two-channel digital system that would satisfy the needs of the car, boat, glider and sport power plane fans. AAM asked me to undertake the project and to try to make it as simple and goof-proof as practical. The project is finally complete and we are pleased to present the results. I n accordance with the above basic requirements, the following more specific objectives were set. The system should be as technically up-to-date as possible; have the maximum flexibility; be the utmost in simplicity with no frills added; and, taking advantage of inherent digital system characteristics, it should have a growth factor for those who would wish to expand the system later. Using a Tektronix 435 scope, Fred Marks checks encoder pulses. Scope is also capable of showing modulation patterns at 27MHz. sections, utilize integrated circuits. The encoder, decoder, and servo amplifiers are all composed of integrated circuits. The use of bridge-type servo amplifier permits a two-wire power pack for the receiver and three wires for each servo. The second objective is the most satisfying of all, as the system has been successfully tested in cars, boats, gliders and power planes. The receiver and decoder are compatible with any transmitter on the same frequency, from one to eight channels. The decoder simply decodes the first two channels that it sees, usually aileron and elevator, and ignores the rest. It will operate any servo made today (provisions are made for battery center-tap wiring), including those requiring a negative going pulse. It has been tested with the following: EK MM3; Orbit PS-4; Micro Avionics; all Kraft servos; Controlaire S4b, S4d, 5-5 and 5-6; Min-X; Digiace; MRC F-700 and F-710; Royal Electronics; Pro-Line; Heathkit PS-9 and I C servos; Larson, and others. The servo has not been as extensively tested in other installations, but thus far has proven to operate satisfactorily with systems using IC decoders and with the Heathkit system which has an SCS decoder. Simplicity was achieved by the use of inexpensive ICs. They offer two distinct advantages to the home or kit builder: (a) their use permits a drastic reduction in the number of solder joints required, and (b) every IC is tested by the manufacturer (this is not done for discrete components such as transistors). The transmitter is further simplified by: the elimination of a metering circuit; the use of an external battery charger, if any; the necessity for only one stick assembly; and the need for only two tuning points. The receiver is simplified by relieving it of the normal clock and sync pulse forming functions. 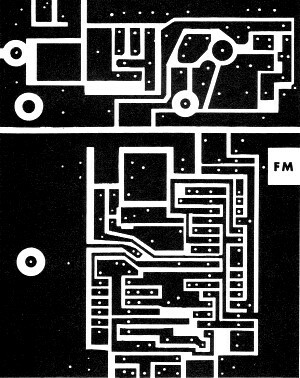 These functions are performed, instead, by the IC on the decoder. The use of the two-wire power supply eliminates approximately 10 points for potential failure. The final objective, i.e., potential growth, is not difficult since any digital system is modular. By building two additional servos, changing to a new decoder board which retains all components except for a new IC, adding a new transmitter encoder board which has one IC, four capacitors, two resistors, and of course, a second stick assembly, a four-channel system is produced. To insure that the system was designed properly and that performance was optimized, the following procedure was employed. The basic system was developed by first designing the decoder, interfacing it with a well-known and tested receiver operated by a six-channel transmitter. 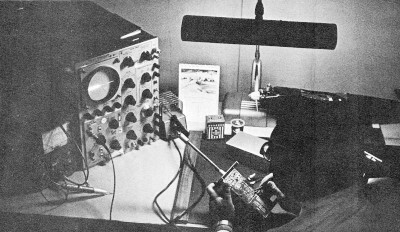 The transmitter was breadboarded and verified on the bench; a P.C. layout was then made and three prototypes constructed. This setup was tested extensively using existing servos. Amplifiers using a Schmitt trigger in each drive leg were tried but we couldn't achieve the goal of placing the servo amplifier on a single board in the smallest servos. Finally, the World Engines IC chip was selected for the servo. This seems to be ideal and only has the disadvantage of requiring an 11 ohm motor. The final problem attacked was the receiver design. We first attempted to use the ready-made ACE Micro Gem receiver modified to add AGC. This performs quite satisfactorily in "cars and boats but does not provide a sufficient margin of performance for planes. 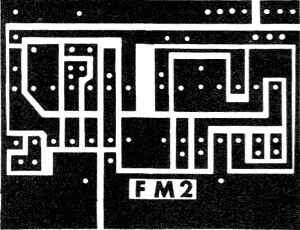 It then became necessary to begin the design of a new receiver which could take advantage of the IC decoder. This done, three prototype units were tested extensively in a two-channel 0.10-powered model called the Flexible Flyer. In order to insure repeatability of the system, artwork and construction instructions were completed and a "pilot" run of ten systems was performed by local modelers. "While the preceding cannot absolutely assure that one will never experience a glitch, it is felt that system performance is well verified. Another important point, not only for this, but for any digital system whether kit or not, is "In case of difficulty .. ." Except for checks of DC voltage, presence of RC output, and verification of transmitter operation using a monitor, an oscilloscope must be available to the builder of any digital system if he is to perform his own troubleshooting. Actually, troubleshooting is quite simple if one can use a scope and knows what the traces should look like. Insofar as practical, this information will be presented, not just to help the builder of the AAM Commander, but also as a means of showing the reader how digital systems work. It can be hoped that a spark may have been kindled to assemble a complete system (transmitter, receiver, decoder, and two servos) or part of the system for use with an existing system. Here is the planned sequence for the "AAM Commander: I n this first part of the series, we have described the system in general, and will now present the printed circuit layout, list the components required, describe how they may be obtained, give the drawings for the subassemblies which may be readied for later use, and provide other information useful for getting started. The second of the series will present the schematics, block diagrams, design information, and instructions for assembly of the transmitter "and the servo amplifier. The third part of the series will present the schematics, block diagrams, design information, and instructions for assembly of the receiver and decoder. At the completion of these, an entire flyable system will be achieved. To aid in better understanding the system and, as an informative item, the final article will: present system integration procedures; show how parts of the system may be used with other systems; provide trouble-shooting procedures; and indicate changes required for expandability. 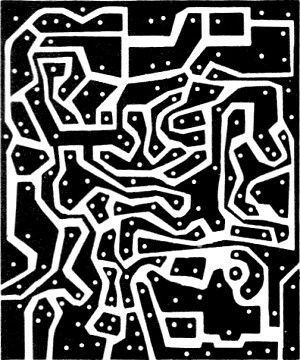 Figure 1 presents a full-size print of the printed circuit layout for the complete system. I n order to make the necessary boards, have a film negative made of the P.C. layout. This is done by photographing the P.C. drawing layouts on page 53 and having a film negative of this made to the exact same size as presented in the magazine. Special arrangement has been made with AAM's plans service to supply the film negatives for $1.00 per set. These may be ordered by writing to me c/o AAM or directly to the Editor. Purchase one sheet of 6"x6" pre-sensitized P.C. board (Kepro S66G was used to make the pilot systems). Also needed will be one pint of P.C. emulsion developer (trichlorethylene) and etchant. Either ferric chloride or ammonium persulphate may be used. These three chemicals may be purchased from a chemical supply house-perhaps the local druggist can suggest one. One may also purchase the Kepro kit for P.C. boards, which has the necessary chemicals, or purchase them packaged separately from Kepro. The sensitized P.C. board is not extremely sensitive to light but must not be exposed to direct light. Use a red lamp while working to set up for exposure. Make everything ready (except for actual board exposure) before opening the package of sensitized board. A lamp socket fitted with a 750-watt photoflood bulb, a pane of glass, and two weights will be needed. Pour the developer (not the etchant) into a shallow pie tin. Turn off all lights except the red lamp. Place the P.C., board on a table (copper side up), and lay the P.C. film negative over it-the letters FM must read properly or the boards will be made backwards. Place the pane of glass over the negative and hold in place with weights. Turn on the 750-watt photoflood and expose the board for five minutes from a distance of 7 to 10 in. Place the board in the developer (trichlorethylene) for one minute; agitate while developing. Remove and permit the board to dry for at least 10 minutes. Do not touch and do not blow on the board. Etch the board in ferric chloride or a solution of 3 oz. of ammonium persulphate per pint of water. (The latter is preferred because the solution is nearly clear, whereas ferric chloride is quite opaque.) The process may be speeded considerably by heating and by agitating the solution. Up to 1800 is adequate-it should not boil. About 15 minutes etching time should suffice. It takes much longer at room temperature. Inspect the boards carefully for unetched material which might cause a short. If patience permits, a check between each land and all adjacent lands with an ohmmeter will insure absolutely against such shorts. The boards are glass epoxy so any attempt to drill with anything less than carbide steel bits is a waste of time. A No. 64 carbide steel drill bit can be used if a very true running collet chuck is used in a Dremel or other high-speed tool. However, bit breakage is a problem. It was found that a No.1 carbide steel, round dental burr fits one of the Dremel collet chucks perfectly and is at least an order of magnitude better than regular drill bits because the shank is about 3/32 in. diameter for excellent stiffness. One bit should drill all the holes needed. Such bits can be obtained from your dentist's supplier. Larger holes will be drilled in the few places needed during construction. Shear the boards, if possible, on a shear used for P.C. boards or on a foot shear used for sheet metal. As a last resort, tin shears will do. Work slowly and be sure the outside line is used for cutting. Haste will make a handful of wasted board! File and/or sand carefully to the final shape. This completes the P.C., boards. Set aside in paper toweling or plastic, where they can't be marred, until needed. you think you know what you are doing, particularly in the case of the semiconductors. No matter what anyone says, the general replacement lines of transistors will not work. Don't buy them! The most general source of supply is through the Allied Industrial Catalog, if there is no industrial supplier in your vicinity. Most of the transistors used are made by Motorola, as are the IC, and are generally available from an electronic wholesale firm. We are happy to report that arrangements have been made with ACE R/C Inc., Higginsville, Mo. 64037, to kit the system. In addition, ACE will include all the individual components in their 1972 catalog. While one may procure all parts and build the system from scratch, the chore is made much easier by obtaining the kit units. The OEM manufacturer for items is identified on the parts list for those able to obtain parts directly through a distributor. The following information may help in obtaining components for any project, and to aid in building kits. The resistors used in the system are 1/4 watt composition types that are 10 percent tolerance. There is only one exception-one 1/8 watt resistor is used per servo. There are four colored bands around the bodies of all the resistors. These will be discussed as the first, second, third, and fourth colors. The fourth color is always silver or gold, while the first color is never silver or gold. Thus, the first color band is quite simple to distinguish. In addition, the first color band is usually closer to the end of the resistor body than the fourth color. The preceding identify the value of the resistor, in ohm's, as follows: (a) The first band gives the first digit of the resistance value; (b) The second band gives the second digit of the resistance value; (c) The third band gives the multiplier for the value, i.e., the number of zeroes which must be added. As an example, consider a 270 ohm resistor; the first band is red, for a two, the second is violet, for a seven, and the third is brown for addition of one zero. A 15,000 ohm resistor is identified by brown (one), green (five), and orange (three zeroes). In the schematics, large values may have the multiplier 1000 identified by a k, such as 15k for 15,000 ohms, etc. Most of the values which are .01 or larger are simply identified that way. Quite often, disc capacitors will have markings to identify the voltage rating such as 10v or 1 kv: do not confuse this with the value of the capacitors. The physical size of the capacitor will be determined by its capacitance and the voltage rating. It is desirable to stick to the physical sizes to be shown on the overlay drawings, otherwise things won't fit. The basing arrangement for transistors varies. Figure 2 presents the basing for transistors which will be used in the system. It is hoped that the preceding data will be posted above the work bench during construction. As indicated earlier, the transmitter and servo will be constructed first. There are some preassemblies that can be done before transmitter construction is started. These subassemblies are shown in Figure 3. 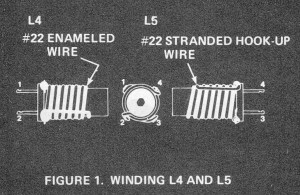 Wind L4 and LS on the CTC 2173-3-3 coil form as shown in Figure 3. The technique to be used is as follows: Using two pair of pliers, grip the ends of a 24-in. length of No. 22 enameled wire and stretch slightly to straighten and "set" the wire. Scrape 1/4 in. of enamel from one end of the No. 22 enameled wire and solder to terminal No.1 of the coil form. Strip 1/4 in. of insulation from one end of a 24-in. length of No. 22 stranded hookup wire. 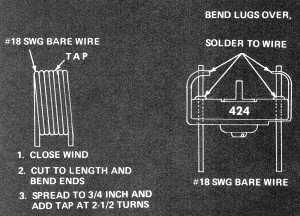 Solder to terminal No.3 of the : coil form. Coat the area of the-coil form onto which the coils are to be wound with S-minute epoxy. Wind simultaneously, Clockwise viewed from the top, both the enameled and hook-up wire as shown in Figure 1. Note that the hookup wire proceeds 1/2 turn to terminal No.1 before winding of L4 starts. Wind both until about 8 turns are on the form. Hold the coils in place until the epoxy sets; the wires can be unwound as needed with no difficulty. Working carefully, unwind the hook-up wire until 5-3/4 turns are on the form, i.e., count up 5 turns from terminal No.3, then on around 3/4 turns to terminal NO.4. Bring the hook-up wire straight down, strip 1/4 in. and tin, then solder to terminal No. 4 to complete L5. Unwind the enameled wire until 6-3/4 turns remain, i.e., count up 6 turns from terminal No.1, then proceed 3/4 turns more to terminal No. 2 for a total 6-3/4 turns. Bring the wire straight down, scrape 1/4 in. of enamel at the junction to terminal No.2 and solder. This completes L4. Recheck the completed coils against Figure 3. The epoxy will hold the coils in place. Wind L7 as shown in Figure 3. The middle size X-acto knife handle is exactly the right size (approximately 1/2 in. diam.) form to wind L7 on. Wind exactly 7 turns of No. 18 enameled or bare wire, bend the ends straight down, and clip to 1/4 in. Remove from the X-acto handle and carefully spread all turns evenly until the coil is exactly 3/4 in. long. Add the tap at 2-1/2 turns from the end as shown in the overlay drawing. Set aside until needed. 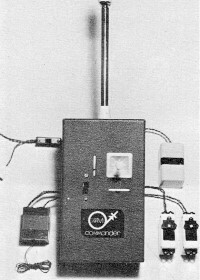 Prepare the antenna trimmer C 18 as' shown in Figure 3. This is done to provide solid mounting for C18 with the adjust screw accessible from the pc side of the board. Set aside until needed. Royal-Electronics Corp. 2119 S. Hudson St.
(order through ACE R/C. Royal Electronics, World Engines, or from Doss Electronics, Inc.